Windows, Glass & Tinting use only the best quality LLumar® Window Film for your glass and tinting requirements. Heat loss through windows can cause discomfort to building occupants and unnecessarily high energy bills. Low emissivity insulating film applied to the inside face of ordinary single-glazed windows decreases heat loss by up to 30%. In winter climates LLumar® films reduce the cost of cooling a building by rejecting up to 80% of the sun's heat and that can make a significant difference in your energy costs. The popular myth is that the winter sun streaming through clear glass provides "free" solar heat. Quite the opposite is true. During the winter day, the sun will warm some windows (perhaps even make them hot) on one side of the building. But during the night, clear glass will lose more heat than it gained and the loss is through every window in the building. The sun is essential to life on earth but too much sunlight is harmful. Unfiltered UV radiation is destructive to human skin, fabric and leather furniture, wood and floors. LLumar solar window film, whether tinted, metallised, or sputtered protects existing glass installations. Protect your house and office and all within. LLumar® films help correct temperature imbalances between sunny and shady areas and it deflects harsh, uncomfortable glare. Employees are more comfortable and more productive. Drawn drapes or closed blinds create a suffocating psychological atmosphere and increase the need for artificial light (which gives off even more heat and increases your energy costs). Now you don't have to give up the view or the feeling of freedom you get from attractive windows, because LLumar® cuts the glare and leaves the light. Make work areas more comfortable by lessening eye strain in areas with computers. Utilize more of the space near the windows too. 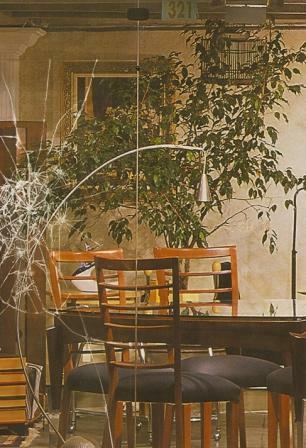 LLumar® films help hold fragments of shattered glass in place reducing the likelihood of injury and property damage. Ordinary glass will break and splinter. And it is splintering that creates the greatest likelihood of injury. LLumar helps hold broken glass and reduces splintering. LLumar® filters out up to 99% of the harmful ultraviolet (UV) rays that contribute to fading in fabrics, furnishings and display merchandise. LLumar® reflects the sun's heat and absorbs almost all (99%) of the incident UV rays. Your furniture, draperies, and carpet fade less and last longer. While house plants are not harmed by the screening action of LLumar®, UV radiation is reduced to the point where furnishings are much less likely to fade. You save on energy costs plus you save the cost of replacing carpet, upholstery...even paint. If heat, energy costs, glare, fading and window appearances are problems... LLumar is clearly the answer. Glass treatment films can add new style to buildings for a fraction of the cost of other refurbishments without the inconvenience of relocating tenants. LLumar® window films can make any room or office space more enjoyable any time of the year. LLumar® films make you or your employees more comfortable and more productive because LLumar® helps correct temperature imbalances between the buildings sunny and shaded areas. Your occupants are happier because LLumar® window films help to eliminate hot, uncomfortable office areas and make windows the assets your architect intended them to be. LLumar® window films make windows work. From the inside, you have a pleasant glare and distortion-free view. From the outside, the uniform appearance of LLumar® complements the building's design, increases privacy and eliminates visual clutter that develops when occupants "personalize" their windows with a variety of coverings, plants and bric-a-brac. Professionally installed, LLumar® with invisible adhesive clings to the natural porosity of the glass and forms a permanent, waterproof seal. Your windows are more attractive, more functional and less likely to shatter. LLumar® "CDF" adhesive system is clear and distortion free. This adhesive system eliminates all the problems associated with pressure sensitive adhesive systems. LLumar® has proved to be much more effective, efficient and affordable than tinted glass. For maximum savings, many architects are specifying the installation of clear glass with LLumar® to be added after the building's glazing has been installed. LLumar® window films have a tough, durable coating which gives the surface excellent scratch resistance and assures carefree maintenance with most conventional methods of window cleaning. ​All LLumar® films installed by authorized dealers in accordance with manufacturers specifications, carry a manufacturer's warranty for film and labor. We can provide you with technical information and warranty details. LLumar® window films are installed as a retrofit product directly to the interior side of the glass. Installation of LLumar® film causes minimal disruption to interior activities and many times can be accomplished during office hours. Windows, Glass & Tinting is a LLumar Accredited Architectural Installer (LLumar® AAI). Give us a call today on 083 254 5420 to discuss your window film requirements or complete the Contact Us form so we may contact you.